Transubstans have managed to find yet another killer band that lives for the 70s sound and feel. 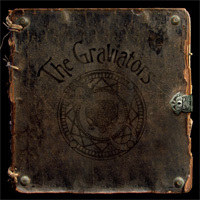 Graviators have found a cool middle ground though between stoner rock grooves and that Black Sabbath-Pentagram-Witchcraft vibe. They also remind me a bit of Electric Mud Generator but with shorter songs. Anyway, the opening track is a killer track with both doom and stoner rock influences. Storm of Creation sounds a lot like the first track but without the slow heavy doomy beginning. A bit Dozer like as well. A lot of nice time changes on this one. Back to the Sabbath slows things down and is one of those very Pentagram like tracks. Juggernaut is an 8 minute track that starts slow and heavy but then becomes quite a cool melodic chorus section. Later the track becomes a stoner rock track reminding me of the Brain Police (Iceland). Cool track and even some guitar solos. Sadly they fade out the best part of the track when they are jamming at the end. Bastards. Shapes of Babylon will remind you of Witchcraft straight away but it really becomes its own track with a great guitar solo at the end. Mountain Man starts with a heavy bass line and a crushing riff to start things off. It actually reminds me a bit of the Sword this track but this has a much better sound than their last record. I like the psyched out guitar solo as well. I should mention that this band has a really good and distinct sounding singer, which is really nice. Saturnis ’84 is an uptempo song with a phaser guitar to start things off, which really gives it a different sound. This is more of a stoner rock track. She’s a Witch is a great hybrid track of that Witchcraft and stoner thing. Cool stuff. Roller really rocks out! Planet Gone ends this fantastic CD with a 9 minute trip!